I found a bench plane at a local antique store that caused visions depicting craftsmen effortlessly shaving paper thin curls with every stroke. In the real world, my experience with hand planes is limited to using a small block plane to make things worse. In my hands, a plane skitters, and chatters, tends to grab grain and rip out chunks of wood. But my father taught me that every fellow needs a plane to “shave a little off” – make things fit – like doors, and lids, and chair legs – just stuff that needs a bit of fitting. 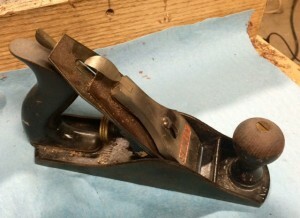 So I keep a small block plane, a gift from him, and I have learned to find creative ways of avoiding it. The Stanley No.4 I found for 40 dollars was old and battered with scars on the loose wooden handles and a fine patina on the exposed metal. I bought it. Whatever. It can always sit on the shelf next to the chisels I use to sharpen pencils, a nod to skilled craftsmen across the decades and a tribute to the woodworking arts residing beyond my grasp. I am sharing my experience because it was a process that left me facing in a different direction than expected, seeing my tools, my time, and my labors from a different perspective. I learned techniques, but I also learned what I can only describe as truths. I find truths to be the landmarks that guide our choices and ultimately our satisfaction. They are what we use to build techniques. Watching video after video of “how to set up your plane,” I learned about using sandpaper on a flat surface to true the sole, how to adjust the frog and lever cap, and how to position the chip breaker. I cut a pattern of thin stock to take the wobble out of the tote. These are techniques and as I applied them I found my attention drawn to the machining marks on the surface of my scroll saw. Would it be easier to use if the surface was slick and waxed? Could I more accurately cut along the line if there was less friction from the table? Yep! Tried it – proved it – truth. I ‘m still amazed by how much a little work to true and dress a tool can improve the way it works and compound your possibilities. All the googalizing to set up the plane led to sharpening the iron and I quickly discovered there are as many ways to sharpen a plane iron as there are people who claim to be experts on it. There are many techniques. The truth here lies in what we consider sharp and that a sharp tool makes the whole difference in how we use it and what we consider limitations. I’ve always taken pride in my ability to put an edge on a knife. My father taught me. Few things bring a smile like the look on a friends face when I pass them my knife to use. They go, “Wow! This is sharp!” I shrug it off with “Meh…. it’ll do”. The truth I learned, is that “wow sharp” is not quite optimal for wood working. I learned that sharp for wood working lies way past dry shaving hair on your arm – it’s out there where you move slowly, carefully…. partly to preserve the edge and partly because it’s downright dangerous if you get sloppy. I think of it as scary sharp, and it completely changes how you use edged tools and the things you value most in your tool box. I’m a product of the machine age, I respect them as leverage to multiply our efficiencies. Machines are good and while I have deep respect for hand tools and the craftsmen who master them, I won’t hide my preference for a thickness planer over a bench plane for thinning stock. Much of my life has been consumed with finding a better, more efficient, more accurate way to do things – the technique, layout, order of operation – sometimes the tool. The truth I found nestled between hand tools and power tools is the measure of time. What does it really mean to feel “this is taking too long, there’s gotta be a better way…” Most of my mistakes happen in that seam where my mind is trying to find a faster solution. The truth is that it is not impatience, it is not that hand tools are slower – they simply require me to embrace a different measure of time. Think of the time to crosscut four-quarter maple with a hand saw compared to a powered miter saw. How about the time to correct if you cut too long or not quite square? “Measure twice, cut once” has a different meaning in “hand tool time” because it takes so much more effort to correct mistakes with hand tools. I find my sketching and planning is much more thorough, I’m much more precise with my square, and I keep my tools much sharper because correcting mistakes has a different meaning on this different time scale. I’m even more careful with the wood, where and how I set pieces aside because it’s not just wood, it’s an investment of my best work, my steadiest strokes. The payoff is my patience and attention span is on the slower scale as well as my sense of accomplishment. I’ve always enjoyed making – building things. I find joy in the sense of accomplishment – the evolutionary nature of “why don’t I just make one” is a big deal to me. This plane and the journey it started has shifted that a bit. With the slower time scale of hand tools, I’ve discovered simple satisfaction in the “doing” instead of the completing. I actually find pleasure in a scary sharp chisel. I mean, building things is great, but now the process is filled with thousands of tiny moments of tools doing exactly what I want. Maybe I’m a simpleton, but I really appreciate the way a well trued and sharp tool works and the building thing, the objective goal, has become the bonus at the end of the process. A pass of the plane will make me smile, and the next one will again, and the next. This antique store bargain dates to the 1930’s, the internet dating thingy calls it a type 15 and the sweetheart logo on the iron agrees. All that combines to make the plane an interesting conversation piece, a trophy of sorts, but to me there’s a different meaning. Its age is representative of the craftsman who held it, used it. The iron is ground in a way to draw up the corners of the bevel, just slightly, like a shallow smile. This grind is intentional, not to gouge, but to smooth, to prevent the edges of the iron from leaving tracks in the wood and convinces me that over several generations, someone used this tool for more than shaving a little off to make it fit. Been doing cabinet work & architectural woodworking installations since 1972. 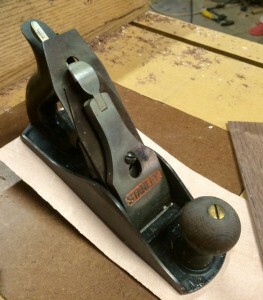 All my hand planes are old Stanley planes , bought from barn sales & antique sales. All have been reconditioned by me and are used as much as possible in my work. I feel privileged too have the opportunity to keep these cutting tools doing the work that the people who used them before did. I once purchased an old hand made tool box from a lady in a garage sale . In the box were several planes , a spoke shave , a hand router and three London town Diston hand saws, What a find!!! Interestingly the lady would not sell these tools that her husband had used to create fine woodworking for many years unless I promised to continue using these great tools and not just put them on a shelf to be admired and collect dust.I Feel Honored,to have these tools and have kept my word , Happily! I inherited a couple from my father that were my grand-fathers’. I set out to bring them back into working condition. That was the begining of a journey I’m still on: finding and restoring older hand tools, mostly planes, I have, and use, all the standard power tools, but there is no comparison to the feel of, or the feeling you get from, using a hand tool to shape wood. It is hard to put into words. It brings you closer to the piece, and invests you in the work like nothing else. Unfortunately, many modern woodworkers do not know that feeling. Power planers and sanders will never connect you to a piece the way a well tuned plane or scraper can. If you get it, no explanation is needed, if you don’t get it, no explanation is sufficient. And yes, tools are for working, not objects of art to be admired. They are the product of years of use and refinement toward the goal of creating things both beautiful and functional.